View the contents of the DVD. View the list of contributors. Cochlear implants, mainstreaming, genetic engineering, and other ethical dilemmas confronting deaf people mandated a new, wide-ranging examination of these issues, fulfilled by Signs and Voices: Deaf Culture, Identity, Language, and Arts. This collection, carefully chosen from the 2004 Signs and Voices Conference, the Presidential Forum on American Sign Language at the Modern Language Association Convention, and other sources, addresses all of the factors now changing the cultural landscape for deaf people. To ensure quality and breadth of knowledge, editors Kristin A. Lindgren, Doreen DeLuca, and Donna Jo Napoli selected the work of renowned scholars and performers Shannon Allen, H-Dirksen L. Bauman, Adrian Blue, Brenda Jo Brueggemann, Teresa Blankmeyer Burke, Peter Cook, David P. Corina, Michael Davidson, Kristen Harmon, Tom Humphries, Sotaro Kita, Heather Knapp, Robert G. Lee, Irene W. Leigh, Kenny Lerner, Carol Neidle, Peter Novak, AslI Özyürek, David M. Perlmutter, Ann Senghas, and Ronnie Wilbur. 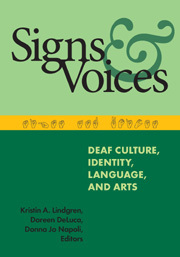 Signs and Voices is divided into three sections—Culture and Identity, Language and Literacy, and American Sign Language in the Arts—each of which focuses on a particular set of theoretical and practical concerns. Also, the included DVD presents many of the performances from the Arts section. Taken together, these essays and DVD point to new directions in a broad range of fields, including cognitive science, deaf studies, disability studies, education, linguistics, literary criticism, philosophy, and psychology. This extraordinary showcase of innovative and rigorous cross-disciplinary study will prove invaluable to everyone interested in the current state of the Deaf community. Doreen DeLuca is an RID-certified Interpreter who works in the Philadelphia, PA, and Washington, DC, areas. Kristin A. Lindgren is director and visiting assistant professor of Writing at Haverford College. Donna Jo Napoli is a professor in the Department of Linguistics at Swarthmore College.